A graduate of Liverpool John Moores University, Jamale Ijouiher is an expert on the North African biota after a decade of research. Having work experience at the Museum & Gallery, Cardiff and the Pontypridd Museum and Tourist Information Centre. Jamale has been involved in many scientific endeavours, most notably in North Africa. Jamale is currently a member in good standing with the The Palaeontological Association and the British Society of Authors. JI: I honestly can’t remember that far back as I’ve apparently had an interest in palaeontology from the very beginning. But after racking my brains, some early memories that come to me include my grandparents taking me to see some dinosaur footprint; I can’t quite remember where, but they were Triassic in age I think. JI: Growing up I remember Bob Bakker inspiring me with his dynamic interpretations of prehistoric life. I suppose another, arguably stronger but more subtly, influence was David Norman who wrote for a ‘‘science’’ magazine called Dinosaurs! that I collected diligently as a child. For a while that magazine was the only dinosaur fix I could get. And while I wouldn’t call them heroes per say, I’ve always had an interest in the history of our profession and with the early pioneers like the Sternberg’s, Mantell, Owen, Stromer, Anning, Cope & Marsh. While modern science allows us to study fossils in a way they never could have imagined, I think part of me still secretly wishes I had been born back in those days. As for my current role models, while there are still palaeontologists I admire greatly, I think the late professor Alan Turner deserves that accolade the most. He was one of my lecturers while I studied at Liverpool John Moores University and later my main adviser when I was writing my dissertation. Despite being primarily a mammal specialist, we became friends and he did a lot to help me move my career forward even when I had graduated and moved on. He is greatly missed. JI: The most important lesson I’ve learnt so far is to have more confidence in myself. I tend to be shy, previously lurking around the margins of the palaeo-community; so, starting to attend conferences and networking with others in our profession was a major step forward for my career. My advice to anyone starting on a career in palaeontology is to always put yourself out there; my career wouldn’t have taken off without the friends and acquaintances I’ve made and the wealth of advice, information and encouragement they provided. Question 5: You do a lot of work with North African fossils. Did you have an interest in this branch of paleontology prior to starting your career or did it choose you? JI: Oh, it definitely chose me (laughs). Some people assume my interest is because I’m of Arab descent, but that’s not true at all. I’ve always tended towards Mesozoic palaeoecology, the more unusual or extreme the ecosystem the better. So, when my mother got me Nothdurft's book, The Lost Dinosaurs of Egypt, as a present I quickly became enthralled. That book literally changed the course of my entire career. The absolute uniqueness of the environment they described and the fauna it contained immediately pressed my buttons. And since then Gondwanan palaeontology, practically North Africa, has been my entire life. Question 6: What was or is your favorite project in paleontology so far? Would you be able to tell us about some of your current projects? JI: My favorite project has to be A reconstruction of the palaeoecology and environmental dynamics of the Bahariya Formation of Egypt. That was the first scientific paper I ever published and served as the basis for my new book. So, I can say, hand on heart, that it was the one that started it all. My long-term goal is to make the Old Kingdom - which I hope to continually update with new information and reissue over the years - the first in a whole series of text books on Mesozoic Africa. The next text book I’ve got planned will be the first of a two-part series on Southern Africa. Hopefully I’ll start writing it sometime next year. As for current projects, I’ve had a planned study on the nutritional value of Weichselia reticulata on the backburner for quite a while now, given the difficulty I’ve had in acquiring modern Matoniaceae specimens to work with. But I’m still hopeful that I can proceed once some living specimens are located. I’ve also got a YouTube series on palaeoecology planned; the first episode is written, it’s just a matter of finding time to actually put a video together. I’m also hoping to go out to Morocco for a study of Cenomanian pterosaurs this summer, although that project is still in the very early planning stages. Question 7: Why did you decide to start The Old Kingdom? JI: As palaeontology progresses I’ve noticed there seems to be an increasing trend in scientific publishing to reconstruct whole ecosystems as opposed to simply name checking various important species from all over the world. Books like Jurassic West, Extinct Madagascar, Dinosaurs of Eastern Iberia, Beasts of Antiquity, Lost Land of the Dodo to name a few of the top of my head. Of course, as an palaeoecologist I think this is all to the good, but I noticed that no one seems to be doing this for North Africa, despite that fact that its fossil beds can easily rivals any from North America, China, Europe or Britain. Given the amount of information now available to us, I’ve long felt that such a comprehensive overview is long overdue. So, while finishing A reconstruction of the palaeoecology and environmental dynamics of the Bahariya Formation of Egypt I made a snap decision to actually do it myself; given the inexorable rise of self-publishing, online publishing and open publishing, the time seemed to be ripe as you don’t need museum affiliations to conduct research and publish anymore. Question 8: Where have you travelled for your career? Do you have a favorite destination when it comes to fossils? Why? JI: I’ve traveled to quite a few places, mostly in Britain, but I’ve seen some of America and Africa as well. My favorite destination has to be the Kem Kem beds of Morocco. Never found anything noteworthy yet, but I still live in hope. JI: Yes, I’ve had my share of criticism; but it’s to the credit of our profession that it’s almost all been constructive and fair. Usually it inspires me to snap back and work even harder to correct mistakes or gather evidence to further prove my point. When looking back at my first drafts of A reconstruction of the palaeoecology and environmental dynamics of the Bahariya Formation of Egypt, I can’t believe how much I’ve upped my game since then. Only on one or two occasions have I had my research simply dismissed out of hand, not based on the quality of my work but simply on who I was. I admit those reviews I simply ignored. Question 10: Jurassic Park and Land Before Time (opposite ends of the spectrum, I know) were just two of the programs I remember as a kid that helped fuel my obsession with paleontology. Did you have favorite shows, movies, or even toys growing up that fueled your passion? Yes, Jurassic Park and the Land Before Time where two of my mainstays as a child as well. But now that you mention it there were two other tv series that I remember fondly. One was a miniseries called THE DINOSAURS, which had fantastic animated sequences. Amazingly I’ve actually still got the VHS tapes after all these years (although I only ever had two of the four episodes). Another favorite series I watched religiously was Jurassica on the discovery channel, although I sadly I don’t have any copies of it on DVD or VHS. I have no idea how well either of these series stand up today in terms of scientific accuracy; maybe since were going down memory lane I should try to find time to revisit them and find out for nostalgias sake. JI: Ugh, you have no idea how badly that argument, ‘‘Why waste money on a field that contributes nothing?’’, irks me as well; especially given how superficially logical and seductive it sounds initially. As far as I’m aware no other branch of science, with the possible exception of the space program, suffers these slings and arrows. The answer to the question of whether or not Henry VIII suffered from McLeod syndrome will provide no economic gain either yet historians aren’t constantly told to justify their existence. This situation is made worse by some scientists who think, and have happily confirmed in the main stream media, that no branch of science has any value other than their own. Call me old fashioned, but I believe that knowledge should be gathered for its own sake, not because you can profit from it further down the road. And given how badly science education is deteriorating in the western world, palaeontology has a vital part to play in cultivating an understanding of the earth sciences in the next generation. JI: I wish you hadn’t asked me that as I’m bad with names and the first palaeontologist I met was when I was invited to a series of lectures as a boy by someone at the British museum of natural history. I remember having a wonderful time, but I can’t for the life of me remember his/her name. So, if that person ever reads this I offer my apologies. Question 13: Why do you think prehistoric animals are so influential to us today? JI: I think this is due to the fact that there is nothing like them around today. And the more ancient the species the more alien and fascinating it seems to us. 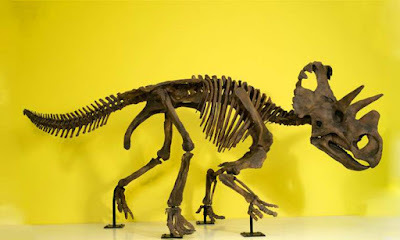 Question 15: What is your favorite prehistoric animal? Was it different when you were younger? 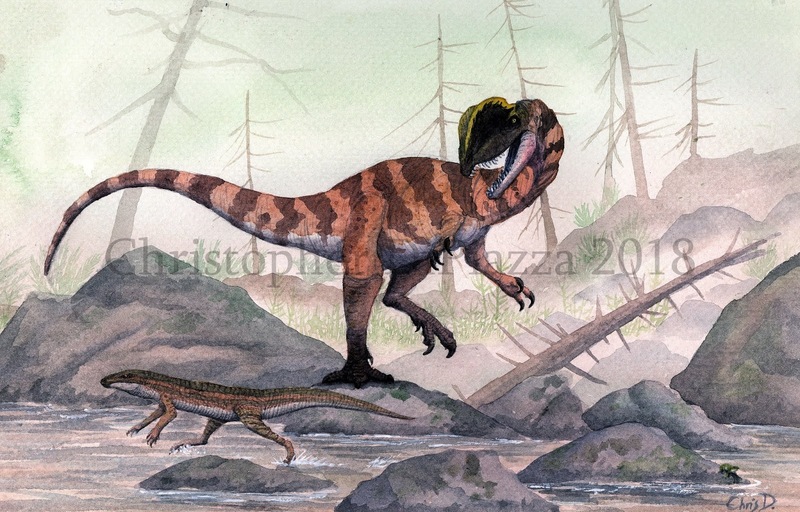 JI: Strangely enough, given my love of North Africa, my favorite dinosaur has got to be Dilophosaurus wetherilli. I fell in love with that guy after seeing Jurassic Park and it continues to hold a place in my heart despite quickly learning of the inaccuracies of that portrayal. Question 16: If you could use a time machine to go back and pick only one prehistoric animal to bring back from history and observe alive and in person, which would it be and why? JI: Now that’s a tough question, and one that would probably get a different answer out of me each time you ask it. 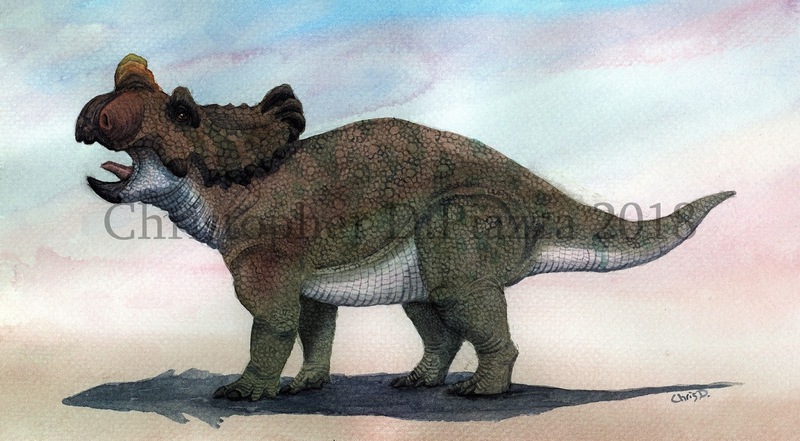 At the moment you caught me in an Australian phase so I’d have to plump for Leaellynasaura amicagraphica. Question 17: Back to the time machine. This time you can go back to any place and time period and have a look at what the environment was really like. Which one would you pick and why? JI: Bahariya. No question. That ecosystem has been my life’s work and seeing it in life would be a dream come true. Question 18: Which is your favorite museum? Why? JI: I’ve recently become enamored of the Oxford University Museum of Natural History, although I’ll probably have a new favorite by this time next year since I’m fickle when it comes to my favorites. I’ve also got high hopes that the Natural Science Museum Rabat and the Cairo Geological Museum can become world class natural history institutions in their own right. JI: I’m into cryptozoology. Shocking I know, but it’s not all about fairytale creatures like Nessie or Bigfoot. There are valid creatures, like the Bramble Cay melomys, that might actually exist and investigating these possibilities is valid scientific research. I must also confess to being a big Sci-Fi fan, especially the old school Steampunk science fiction like H. G. Wells, Arthur Conan Doyle and Jules Verne; although I also enjoy modern fare such as Babylon 5.